Posted on November 1, 2014 by On a Higher Note. Philip O’Hanlon (left), of On a Higher Note, and Bruno Putzeys, the brilliant designer of Mola-Mola. 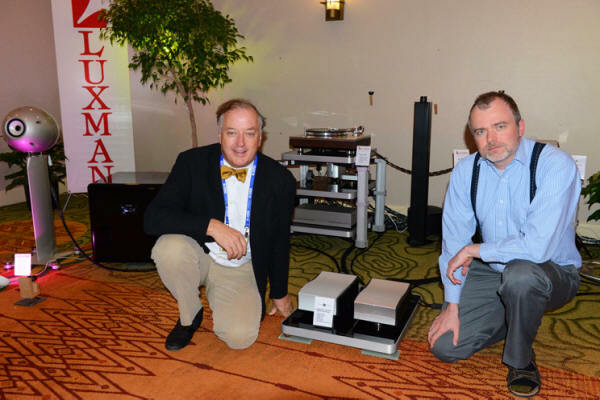 Between them are a pair of Mola-Mola Kaluga monoblock amplifiers ($18,000/pair) being driven by the Mola-Mola Makua preamp ($13,450) with optional phono section ($2,500). The Android interface for the Mola-Mola phono section of their Makua preamplifier. This is the most powerful control for the most complete set of phono parameters that I’ve ever seen…mind-blowing! Soon to be available in an iPad app, as well. “The results were truly satisfying at the level of soul: LPs had the rightness of groove that made me sit back, unwind, and connect with the music. Dynamics were excellent, transparency was very fine, and the low frequencies were well in hand with the Eclipse subs, which were components that I hadn’t encountered before. 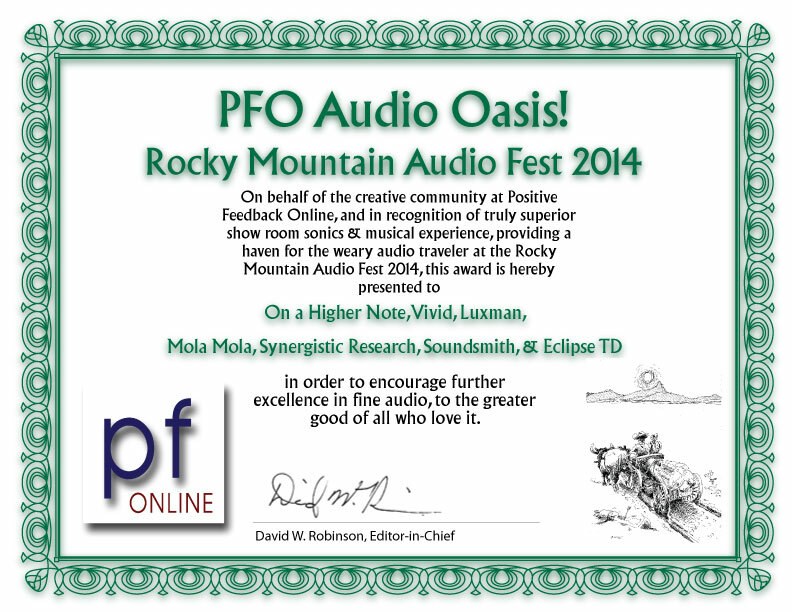 The integration of bass with midrange and higher frequencies was very nicely done…commendable. Further, this room had a really interesting holodeck-like effect, with surprising soundstaging and imaging…for reasons that I would discover. 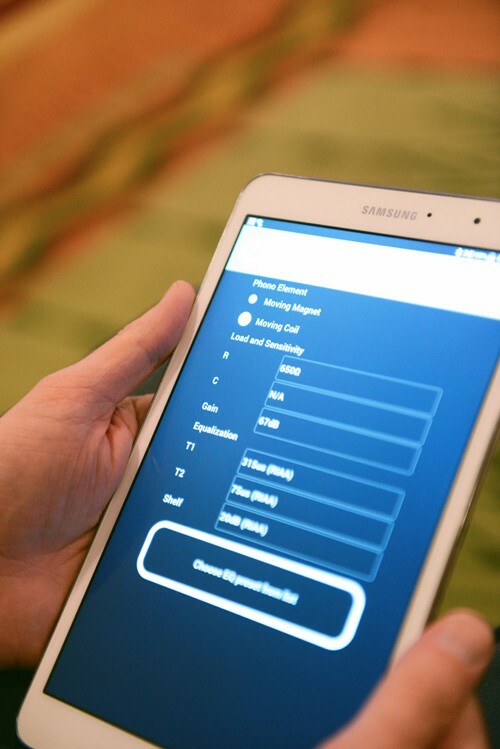 You’ll see in the photograph above one of the most remarkable things about the Makua preamp phono section: It was being controlled by an app on an Android pad! This app was the best thing that I’ve ever seen for controlling the parameters of LP playback. Bruno demonstrated this to me on the Android pad. It had all sorts of elements that you could select and change with the touch of a finger: Gain (via relay control), loading, mono or stereo, EQ, curves, cartridge type, etc., are all there. There were multiple stored profiles for just about every cartridge and just about every curve that’s ever existed. This is an exciting marriage of digital controls with pure analog preamp operation, since the digital domain is used only to set parameters in the analog domain. No A/D is involved in the playback itself. Damn. This is flat-out fantastic. Vinyl lovers everywhere really need to check the Makua with phono section out…killer stuff, amigos! … My experience with the On a Higher Note room, on two separate occasions, sold me. This was definitely an Audio Oasis! winner, with a number of surprises for me. Read full post from PFO here. 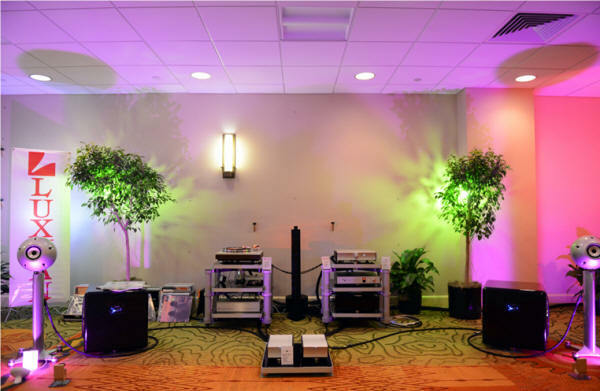 This entry was posted in Awards, Press and tagged Audio Oasis Award, Eclipse, Luxman, Mola-Mola, On a Higher Note, RMAF, Vivid Audio.